I learned about the Dunning-Kruger effect at a medical conference recently. It certainly seems to apply in medicine. So often, a novice thinks he or she has mastered a new skill or achieved full understanding of something complicated, but as time goes on, we all begin to see how little we actually know. Over time, we may regain some or most of our initial confidence, but never all of it. Experience brings at least a measure of humility. Just the other day I finished a manuscript for an article in a Swedish medical journal with the statement that, 38 years after my medical school graduation, I’m starting to “get warm in my clothes”, as we say in Swedish. I think the Dunning-Kruger effect applies not only to people who are in the beginning of a career in medicine, but also to people who learn about it for purposes of judging its quality or efficiency or of regulating or managing it from a governmental or administrative point of view. I think many people outside medicine think “how hard can it be” and then proceed to imagine ways to change how trained medical professionals do their work. But the Dunning-Kruger effect is also a particular problem in rural primary care. Newly trained physicians, PA’s and Nurse Practitioners are asked to work in relative professional isolation with full responsibility for sizeable patient populations. Unlike the hospital environment, primary care practices seldom have time earmarked for teaching and supervision, and there is little feedback given to such new providers. There is also very seldom collaboration and communication about specific patients or cases. We probably get more feedback from our specialist consultants than we do from the providers in our own clinics, because we are all busy with our own patients. 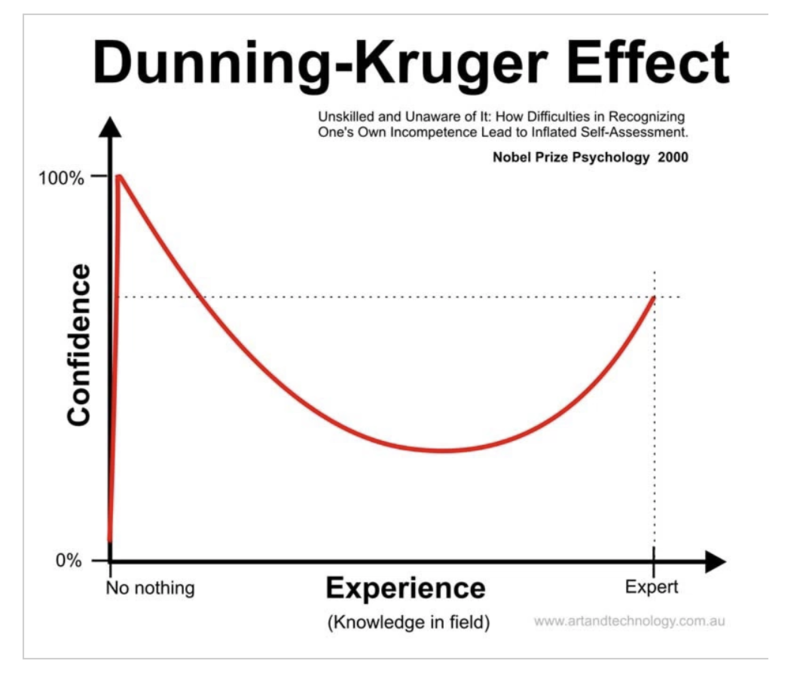 So, how does a new clinician avoid the newbie hubris Dunning and Kruger describe? Seek out potential mentors and ask them to be yours, start a case conference at your clinic, read the leading journals, NEJM, JAMA, BMJ, The Lancet and ones like them, and read about the history of medicine and the old masters. And consider honestly how often a brand new driver should expect to instantly do better than the person who taught them, parent or driving instructor. A medical license is in no way proof of mastery of the art of medicine, it is only a license to begin practicing, in a very literal sense. Hans Duvefelt is a primary care physician in Maine.